Problem: voicing is increasingly difficult, and/or after replacement the voice does not improve. There are 2 reasons for this problem. The first reason is that prosthesis might have become too long due to the gradual subsiding of the edema of the party wall. 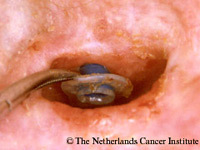 During digital occlusion of the stoma, the too long prosthesis might then be pushed into the esophageal back wall, by which the flow of air is obstructed, leading to a strained voice. Additionally, this might cause edema of the back wall, escalating the problem. Furthermore, these patients also might complain of a foreign body feeling and/or a decreased passage of solids. This problem is easily detected when rule number 2 of the replacement procedure is correctly executed: by pulling with a hemostat on the tracheal flange, the proper length of the prosthesis should be established (as shown in the figure right). A good, additional method to detect that the too long prosthesis is the problem, is to let the patient voice without the prosthesis in situ: if the too long prosthesis is the problem, voicing will be easier without the device in situ. In this situation downsizing is the obvious solution. The other reason for this problem is ‘overgrowth’ of the prosthesis with esophageal mucosa (esophageal pouch), which has not been identified at the time of replacement (see also ‘separation of the party wall’). It is of utmost importance that the esophageal flange of the prosthesis is really situated in the esophageal lumen. This can be verified by carrying out a flexible endoscopy, but this might not always be available and is also seldom necessary. The best way to ensure that the esophageal flange is in the esophageal lumen, in case of doubt, is to ‘overshoot’ the prosthesis into the lumen of the esophagus and then pull the device in place with the help of one or two hemostats. Another option is to use the traditional retrograde method, which always ensures proper positioning of the esophageal flange. Although this latter procedure is seldom needed in daily practice, it should be kept in mind as a problem solver.